Pants in two lengths in proportioned sizes. The long and short pants, without waistbands, have side zipper. Short pants may have turn back cuffs. Pattern is uncut, complete and still in original factory folds. 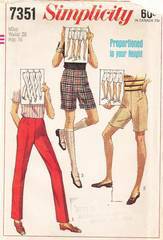 Pattern pieces and instructions are in excellent condition. Envelope is complete; upper edge wear; good condition.